There is a legend about the Monastery of Montebello and Gino Girolomoni. This legend is mysterious, seductive and perfectly reflects the mystical figure of the man I had the privilege of meeting. Gino had a vision when he saw for the first time the monastery, which had been abandoned and invaded by the trenches. A chariot, in particular a fire chariot, appeared in the woods adjacent to the building. This is an image that recalls biblical symbols, and because of his profound religiousness, he interpreted these symbols as a divination, a divine message indeed, to which he relied that the monastery had to be brought back to life. His youth was certainly not easy, he had modest and peasant origins, with no mother and with a sick father. You could read it in his adult eyes. However he had always been a resolute although smart type, he felt that the world was changing and he was constantly wondering how it would change and what he could do to keep it as intact as possible. He believed that those changes could overturn him and his beloved places, the country-sides and everyday life where everything was meaningful. That was how he formed with the young people of Isola del Piano a community farm, working the land and managing stables with real cows. “I remember especially the cold of winter” one of them said to me – it was Peppino Paolini, recently mayor of the Island of the Piano – showing me some black and white pictures: Peppino and Gino under a meter of snow and the shovels next to the monastery. It was certainly not easy, and in fact the community failed and everyone left, but Gino remained. 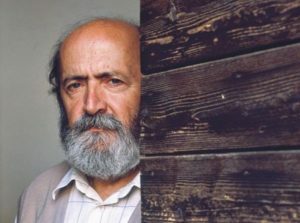 He remained deeply convinced of his own project, together with Tullia (his wife), who remained next to him and gave him three children, and then the monastery, the inn, the pasta factory, the co-operative and the message of a pesticide-free agriculture and consequently of healthier food. All gathered in a single symbol: Alce Nero. What was Alce Nero and what represented for Mr. Girolomoni? I believe that it meant several things altogether. A Sioux warrior who resists, resists to Western civilization, resists in the name of nature; a warrior who has a vision and tells everyone about it, the warrior who converts to Catholicism while maintaining his traditions, the warrior who tells stories (i.e. Alce Nero speaks) so that his screams do not disappear in the wind. Gino Girolomoni was Alce Nero. Self-taught, studied and read continuously. At the time he became an essayist, collaborated with several newspapers, wrote books and established a magazine “Mediterraneo”, in addition to chairing the Alce Nero foundation, kept relations with intellectuals and politicians of his time: Sergio Quinzio, Guido Ceronetti, Paolo Volponi, Marina Salamon, Massimo Cacciari, Moni Ovadia, Andrea De Carlo. These are just some of the names that were his guests at the Monastery and have spoken in one of his many conferences that attracted many beautiful minds from all over the country and from Europe. Meanwhile, the monastery was restored over forty years, and it is finally completed with the restoration of the church. Still today it is possible to admire it since it hosts the museum of peasant civilization. Gino had finally turned his vision into reality: an extraordinary work, if you could only see the greatness of the building that I invite you to visit, upon the hills of Isola del Piano, on the plateau of the Cesane overlooking the sea and the road leading to Urbino (which is only a dozen kilometers away), through a beautiful and open road, because it is high and panoramic, surrounded by coniferous woods and oaks, which fortunately belong to the public property. “These pages were written by one who overthrew the ground with the plow dragged by the oxen and that it does today with the tractor, one who has dropped the hay with the sickle and that it does today with the engine. One who therefore knows the difference too well. At the end of the 1950s, the population of the countryside of Isola di Piano still lived as in the past centuries, the only difference was wheat threshing machines and the delightful consequence that resulted from it: instead of the acorn bread at the beginning of the century, now you had wheat bread. Television was not even there and neither the fridge nor the washing machine. There was no car or tractor. And there was still no plastic, the basin containers were made of wood and those for iron cattle. There were no roads through which these things could come. Only the “poor” Mr. Secondino was visiting home, with his biting mare, selling soap and preserves and taking the eggs in return, and Cimicia came to buy hare and rabbit skins. Once a year, Baffone came to sell the combs, shavings, and orgies, and whenever it came to me, I wanted to play it while my grandfather used to do the cane bush. Then, once a year, the knife grinder would visit home and then the person who could bring the broken crocks. In March came Din Din with the almond to produce Grappa from the marc and slept in the stable. The lack of main roads caused many difficulties, for example, you had to fetch the midwife or doctor by sled or by cart carried by oxen, on Sunday you could see people coming down from the hills with the shoes in their hands they would wear before entering the village. There was no running water and there was no electrical power and the lighting was obtained with the oil lamps and the centilene. Still in the 1950’s, peasants said that if they had had the water, the light and the road then their condition would be more bearable. Since the end of the 1950s the road has come, then the light and then the water but the people of the fields have gone anyway. Why? Because people in those years were affected by a serious illness, the illness of asking questions (only rich people had questions before, while peasants had no time for questions since they had to work) Why should I give half of my earnings to the land owner? Why can’t my children study? Why can’t I have a comfortable and clean home? Why then, when I go to town in the offices, I am looked at in scorn and nobody would ever listen to me either? After asking themselves these questions, they went along the Flaminia road between Fossombrone and Fano and along the Adriatic road to paint synthetic wood furniture or to become manual laborers. But also many peasants who owned the fields they worked had gone and so what is that caused the escape from the countryside then? The children who have been in school somehow, the wife who has sometimes seen the city has been seduced and has convinced her husband to get home in the monotone and exterminate suburbs. And so you leave your land, your traditions, your friends thinking that you need a better income and services of the nearby city to compensate what you lose from leaving the fields that were your father’s and your father’s dad and where everyone knows who you are and what’s your name wherever you go, while nobody knows who you are. By the way the motorcycle came and then the washing machine and refrigerator, then the tractor, the gasoline motoffs, and so many oaks were cut down before it was hard to cut them and left them there. Today, the amount of agricultural production has increased but not the quality due to artificial fertilizers and herbicides. Health quality has also suffered greatly, there is no more than a farmer who has no illness for which, if he does not grow up soon, he can no longer carry the field. The fertilizer and herbicide dust that has been breathing has been very damaging, but the health of the earth is going to collapse: two years ago in Holland I stopped to see a field of grain and touched the ground and the small, sick ear, the earth seemed no longer earth but a synthetic product. And what about our fruit plants that no longer fruit unless they are repeatedly treated? By now the ecological balance of nature has broken and only nature, in a way disastrous for men, can restore it. The fuel used to come from the field near home and it was hay and grass, now it comes from Saudi Arabia. At home the women made pasta and bread, the oven was fueled by wood and the wood did not cost anything. You could have bran for feeding pigs from the grinding of wheat. Before the machines were there, there was also time to make bread, now that there are tractors and the car that time no longer has them. My speech does not want to say anything, I only say that something is not working properly: now that there are tractors in the countryside with all the accessories, the peasants work the same number of hours as if there were cows. And the money in their pockets remains as much as before. And so? Then there is something that is not working, or maybe, nothing actually works! A great civilization has practically disappeared: wooden plows, woolen weaving looms, stones worked to wrap silkworms, the giant plateau to make quails and barrels, each family produced hemp and wool and silk, and he worked, from the wood of the wood a chair, a drum and a bowl were made. Each family was self-sufficient. The stone mill is the last stone-stone left in Isola, the guns for the gates are the only blacksmith, the chairs and the shoes, and the baskets and the baskets, my father’s generation is gone, will not know how to do any more. “Sulle tracce dei nostri padri (On the footsteps of our fathers)”, Published by Foundation Alce Nero, 2000. This was written in 1973. His words are prophetic: maybe they deserved much more reflection. If we think about our times decay, about closing factories and the development of China helping destruction of nature, that reacts with never seen before ecological disasters, I believe that perhaps the escape from the countryside was a big mistake, just like Gino used to say.